This is a sponsored post. The PEEPS® and PEEPS & COMPANY® products, information, and additional gift pack have been provided by PEEPS® and PEEPS & COMPANY®. All opinions are 100% my own. Decorate for the holidays, or go caroling and invite everyone back to your place for a hot cocoa bar, made all the more merry with Holiday Peeps®. It’s an easy no stress party, you just have to set out! I was looking outside last week and realized we’d kind of neglected our outdoor space. We’ve been so busy, there just hasn’t been time to care for it like I’d like. Knowing we had a fairly nice day coming up on Saturday I started making plans. I had my package of Holiday PEEPS® on hand, and Mark the day off. Friday night I made sure the inside of the house was clean, so Saturday we could spend the whole day outside! 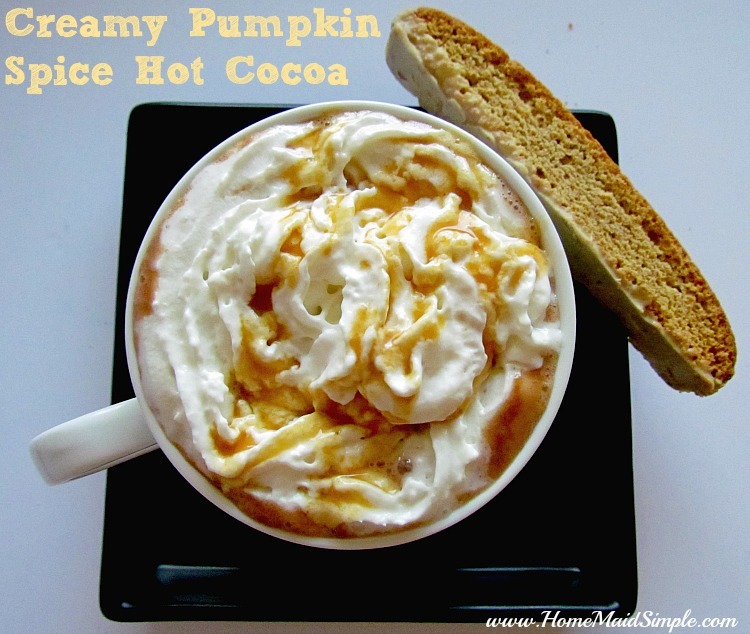 I sent the kids out with rakes and trash bags to work on the leaves, gave Mark the job of hanging some Christmas lights up, and I took to preparing the Hot Cocoa bar. The kids kept running over to check out each package of PEEPS® I pulled out, and therefore got very little yard work actually done. 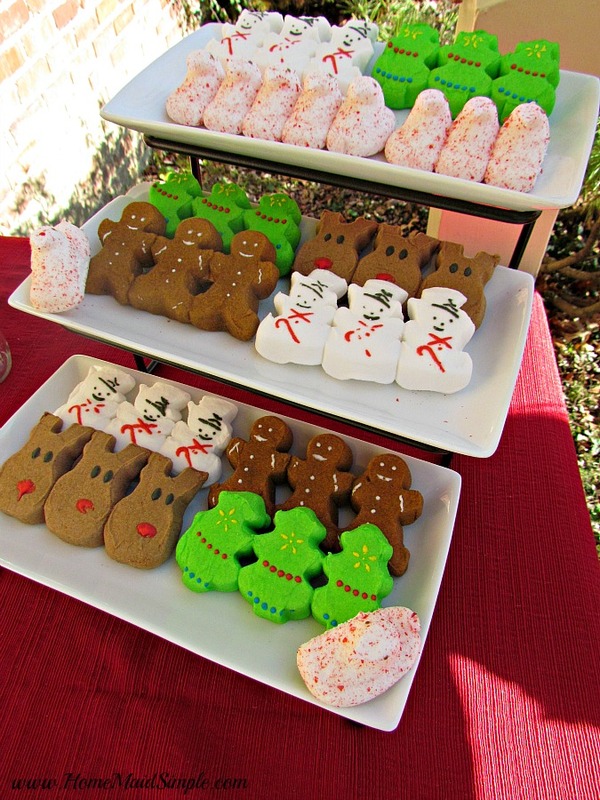 Christmas trees, Reindeer, Snowmen, Gingerbread Men that smell amazing, and Peppermint covered PEEPS®! The kids could NOT wait to get started on this party. “I want that one! Can I have 2? How about one of each! ?” I worked as fast as I could, but I also wanted them to get yard work done, so I definitely made this a party worth waiting for. 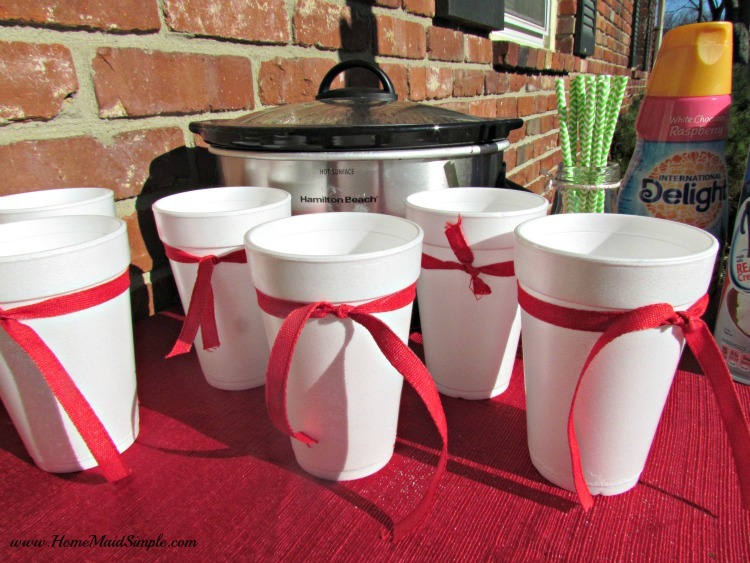 Adding a touch of red ribbon around the styrofoam cups added a perfect holiday feel without being over board or too complicated. I matched them with green straws for a well rounded Christmas look. 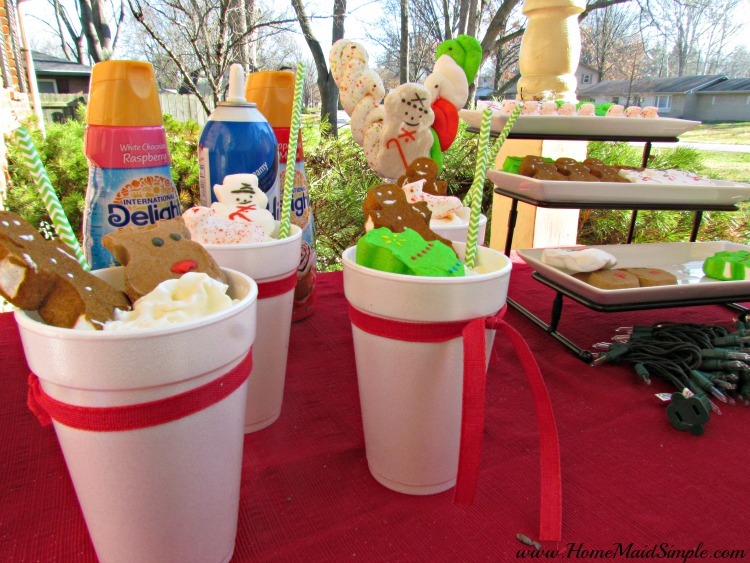 The Hot Cocoa was finally warm – but not too hot – the cups were ready, and our PEEPS® were looking fabulous. All the kids had to do was pick their favorite creamer flavor, and which PEEPS® they wanted on top. Then the fun really began. Later this week, or possibly next I plan on doing some caroling. It’s a great way to get the kids learning some Christmas songs, and the perfect opportunity to meet our neighbors and take them some little gifts I made. Who knows maybe some of them will come caroling with us creating a snowball effect, and then we’ll all come back here for more hot cocoa and PEEPS®! This could also be fun to do for an early morning teachers meeting, or work party. 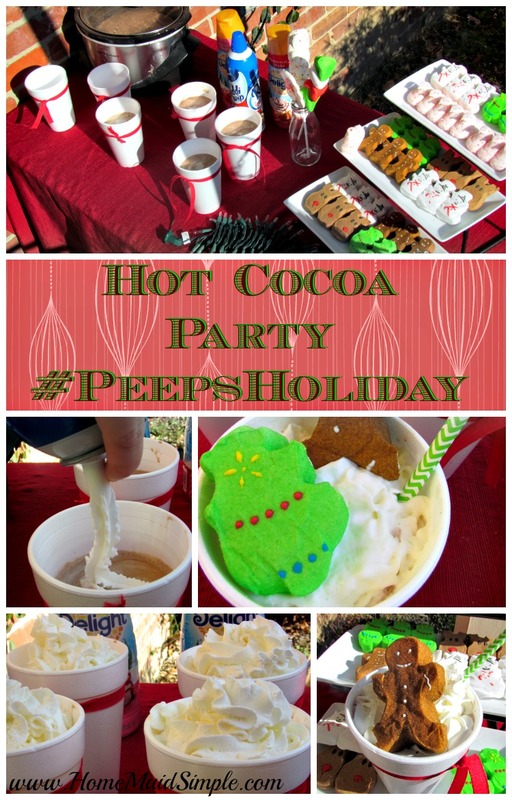 Want to win a package of PEEPS® for your own Hot Cocoa Party? 1 Winner will receive a package of 5 Holiday PEEPS®. This idea is adorable!!!!!! I am totally doing this soon!!!! 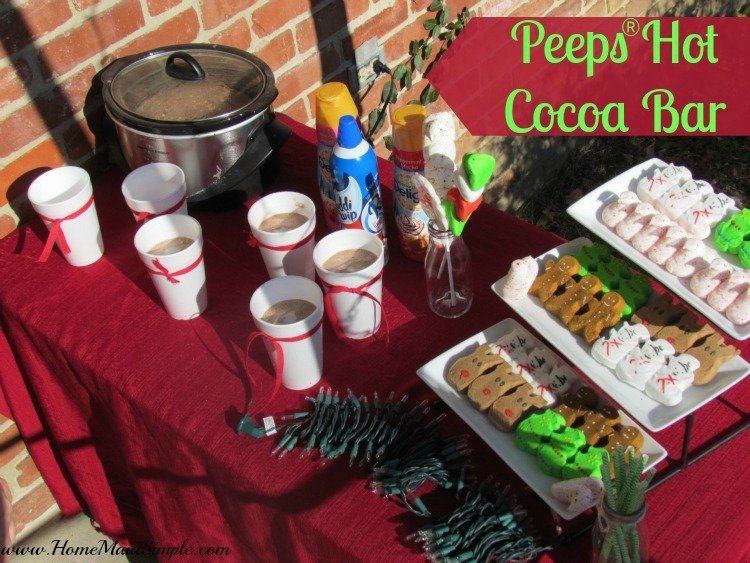 I had to pin this to remind myself to do a Peeps Hot Cocoa bar next year if not before. So cute!!!!!! Love these ideas! They are quick, easy, and you can eat the decorations! The best part is that my kiddo’s would be able to help!